Is it better to give, or is it better to receive? And whilst that’s a life-changing question that one might never find out the answer to, here are 10 designer gifts that most everyone will love, will need and of course, will want, unless of course he/she is a modern-day hippy who prefers to braid their own accessories with coconut fibre. But back to the post at hand. While bags and SLGs will make really good gifts on any given day, here are 10 accessories that are fun and functional, with some guaranteed to jazz up most any outfit. Without further ado, here goes. First up, two pieces from Chanel. The French luxury house’s Fall-Winter 2018 collection is about to hit stores real soon, so keep your eye out for these two brooches. Opt for something classy-looking like the flower brooch (SGD1190) that comes in a mix of glass, metal, resin and strass. Or go for something more intricate shaped like a maple leaf (SGD3710) with cool tones of blue, gold and grey. Under Maria Grazia Chiuri’s direction, Dior has been reinventing the wheel, including these two pieces that come from the costume jewellery section. The Lucky Lock Locket Bracelet (POA) is a solid piece made for those who love it chunky. Need something with bling? The L’Amour Avenir Brooch (SGD520) will do the trick, coming in a gold-tone aged metal that’s laced with 16 white crystals around the heart-shaped J’ADIOR hardware. It’s a bit hard to miss out on #FendiMania, especially when it’s popping up everywhere on social media. Love the all-new logo but don’t wish to get a new bag? Get the Strap Thru (SGD750) that’s essentially a glazed fabric cover that can be slipped over your bag’s existing shoulder strap. Not only does it give extra support, it’s also totally eye-catching as well. And no, the other piece aren’t the hoop earrings that you saw on Adwoa Aboah in the brand’s Fall-Winter 2018 ad campaign. In fact, it’s a large key ring that’s almost palm-sized (SGD610) that can double up as a bag charm if you like. Moving along, there’s Gucci’s keychain (SGD290) that comes with the brand’s licensed graphic SEGA font, especially when it comes in a lovely Fuchsia/Green combination. 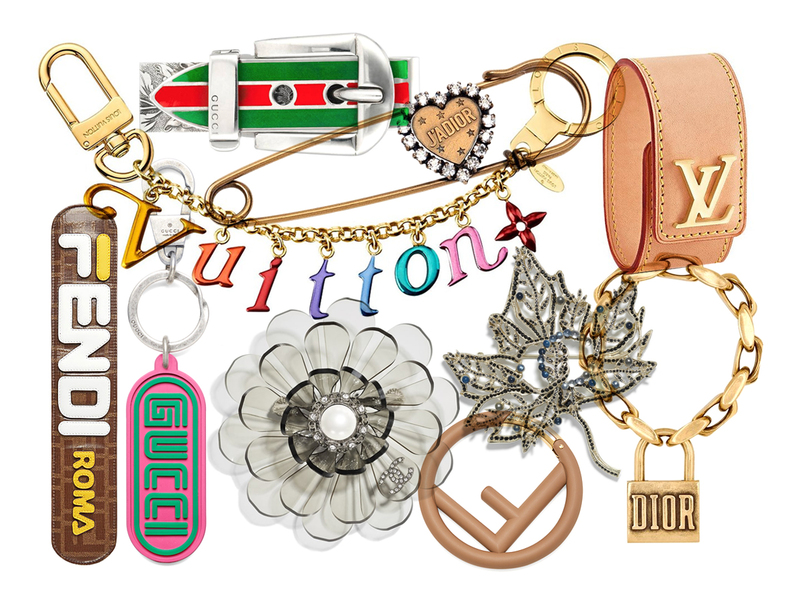 If you fancy something more functional, how about a money clip from the Gucci Garden line? Made of sterling silver and finished with enamel, it is one piece that ages beautifully over time.